As fans of Phish continue to bask in the afterglow from last summer’s historic 13-night run at Madison Square Garden, today the band today unveiled plans to officially release these concerts in multiple formats. Fans will have the options to purchase these shows as either a complete box set featuring 36-CDs, or 6-LPs, or 3-CD sets. We’re excited to announce the release of The Baker’s Dozen, available for pre-order now in three formats: a 3-CD or 6-LP set (with 13 tracks hand-picked by the band) and The Complete Baker’s Dozen Box Set, which includes the ENTIRE run on 36-CDs. Legendary engineer Elliot Scheiner (Steely Dan, Van Morrison) has remixed each show. The Complete Baker’s Dozen Box Set includes every note of music from the historic 13-night run on 36 discs. Included in the fully custom box are all 13 individually packaged shows, an 86-page book with full color photographs from the run, an extensive essay featuring new interviews with each band member, Baker’s Dozen setlist journals, an embroidered patch, commemorative tickets, a complete set of eight mini-prints and a brand new Jim Pollock screen print (7″x10″, signed by Pollock). The Complete Baker’s Dozen will be limited to ONE PRINTING and when it’s gone, it’s gone. The Baker’s Dozen: Live At Madison Square Garden (all formats) will be released November 30th. Both the 3-CD and 6-LP sets will be available in limited supplies in stores. 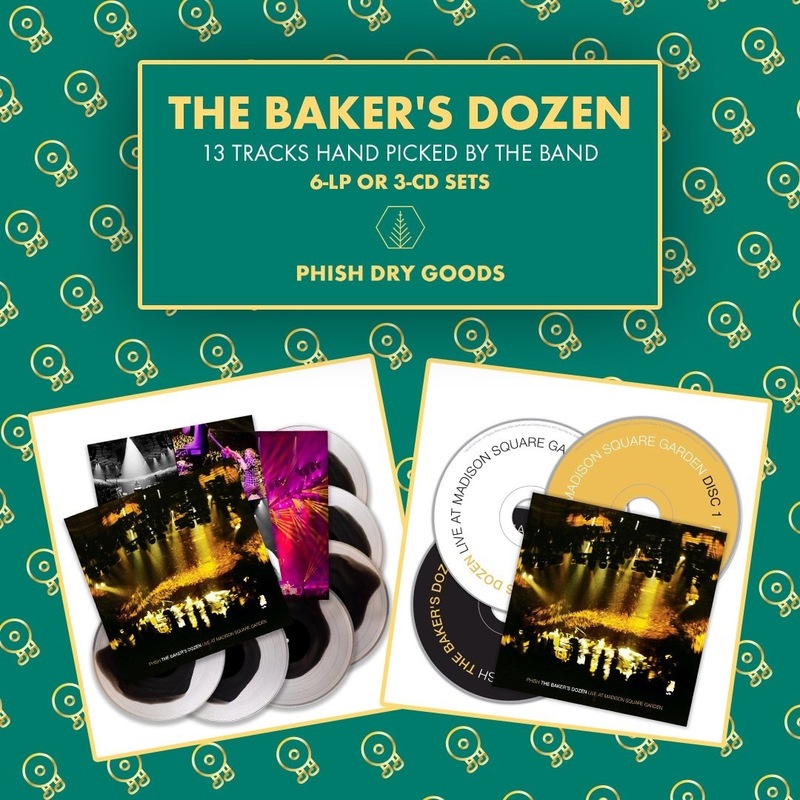 The Limited Edition Complete Baker’s Dozen Box will only be available from Phish Dry Goods. Pre-order today from The Donut Shop at Phish Dry Goods. If you order any of the three releases, all other donut merch in the shop will be 20% off. The 3-CD and 6-LP sets ship for just $4.99 and The Complete Baker’s Dozen Box Set ships FREE. Pre-order now at Dry Goods.